Apparently, today is my day to review “books about things that are hard to describe”! You know what is really hard to describe? Growing up. There are SO MANY books about it but not enough of them really describe the emotional states of going from a younger child to a preteen to a teen. Calling My Name does it beautifully: lyrical writing in short chapters, little vignettes sharing moments of a life. 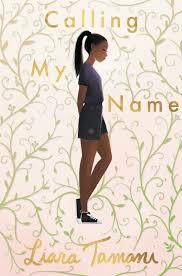 The book makes you root for and care deeply about Taja right away, and you only grow to care about her more as you share her inner thoughts, no matter how seemingly random or disconnected from the larger narrative. It helps that the real larger narrative here is just “growing up”, with a little bit of “falling in love”. Those who need books to be heavy on plot, with twists and turns to follow, probably won’t enjoy this and will find it slow paced or pointless. But despite there being not much that actually happens in the story, I devoured the book in a day and was desperate to know what Taja experienced next. Taja and I couldn’t be more different in how we grew up, except maybe the restrictive religious stuff, but some things are universal, and the author really knows what those things are and describes them well. If you want a quick read that will leave you feeling satisfied and thoughtful, this is definitely a good choice. If I had any criticism it’d be that I was left wanting more of it, but I’m certainly not going to ding a book for being so good I wanted to read more pages. Share the post "Lovely Description of Growing Up"
This one has been on my TBR since it came out . . . someday I’ll get around to it!